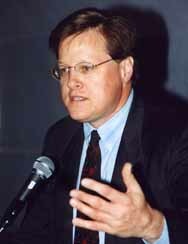 Kevin B. Zeese is President of Common Sense for Drug Policy. He is one of the nation's foremost authorities on drug policy issues. Mr. Zeese has worked on a wide array of drug related issues (Curriculum Vitae) since he graduated from George Washington University Law School in 1980. Kevin Zeese has written for newspapers and journals on a range of drug issues, including an op-ed in the Wall Street Journal on the Colombian drug war. He has also appeared on every major television network as a commentator. He served as a consultant to Walter Cronkite for the Discovery Channel special: The Drug Dilemma: War or Peace? He has spoken at nationally recognized legal seminars and testified before Congress on drug related issues. A Feb. 2005 interview with Mr. Zeese on the syndicated radio program Cultural Baggage is available. You can listen in Real format or you can listen in MP3 format. In April 2002, Mr. Zeese debated DEA Administrator Asa Hutchinson at a conference hosted by Rice University's James Baker Institute. Segments of the forum, "Moving Beyond the 'War on Drugs'," including the Zeese-Hutchinson debate, are available as streaming video. Also, see a streaming video of Mr. Zeese at a Cato Institute forum on medical marijuana by clicking here. A listing of articles in which Mr. Zeese appears is available by clicking here. He is the author of Drug Testing Legal Manual , Drug Testing Legal Manual and Practice Aids and co-author of Drug Law: Strategies and Tactics , all published by Clark Boardman Callaghan. Mr. Zeese served as editor of Drug Law Report for Clark Boardman Callaghan from 1983 to 1998. In addition, he is the author of Drug Prohibition and the Conscience of Nations . Mr. Zeese is the editor of Friedman and Szasz On Liberty and Drugs and has edited numerous books on drug policy and manuals on criminal defense. Kevin Zeese has litigated a variety of drug policy-related issues. Among these are the medical use of marijuana, the use of the military and national guard in domestic drug enforcement, the spraying of herbicides in the United States and abroad on marijuana, drug testing of government workers and the right to privacy as it relates to marijuana in the home. He has been a legal advisor to needle exchange workers prosecuted for their anti-AIDS efforts, buyer's clubs who distribute marijuana to the seriously ill and medical marijuana patients prosecuted for the medical use of marijuana. Mr. Zeese facilitates the Alliance of Reform Organizations, a network of all the major reform organizations in the United States. He serves on the Executive Committee of the Harm Reduction Coalition. He also serves on the Board of Directors of the Drug Policy Forum of Texasand is a Board member emeritus of the DrugSense. Mr. Zeese is a co-founder of the Drug Policy Foundation (now renamed the Drug Policy Alliance), where he served as Vice President and Counsel, and is a former Executive Director and Chief Counsel of the National Organization for the Reform of Marijuana Laws. Zeese served on Baltimore Mayor Kurt L. Schmoke's Mayor's Working Group on Drug Policy Reform and serves on San Francisco District Attorney Terence Hallinan's Harm Reduction Council. Both are efforts to implement a model urban drug policy. More recently, Zeese has been involved with advocacy related to: the fatal shooting of Esequiel Hernandez,the legal rights of patients, doctors and their caregivers in California and the UN special session on drugs. In 2000, Kevin Zeese was the recipient of the Richard J. Dennis DrugPeace Award for Lifetime Achievement in the Field of Drug Policy Reform from the Drug Policy Foundation at their 13th Annual International Conference on Drug Policy Reform.